The larger filter chamber and high flow rate make canister filters one of the most effective filters for media to large fish tanks. 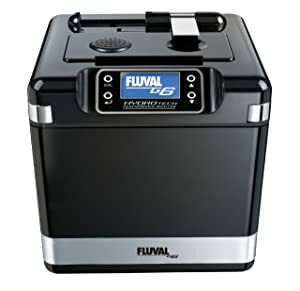 There are many well-known brands for you to choose such as Fluval, Penn Plax Cascade, Eheim, Aquatop, SunSun… The best canister filters are ones that can excellently perform all three types of filtration (mechanical, biological and chemical), especially the biological filtration to ensure aquarium water clean, clear and safe for fish. 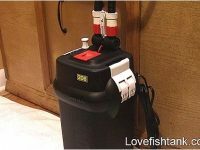 In this review, I will provide you some tips for choosing the right canister filter for your fish tank. What is a canister filter and how it works? How to choose the best canister filter? Canister filter is a powerful and large aquarium filter that is superior of performance of biological, mechanical and chemical filtration. 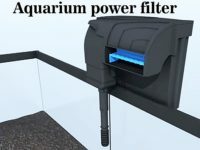 You will find an external canister filter system sitting under or next to the tank, generally under a fish tank stand. There are also small internal canister filters for small aquariums; however, the external ones are more common. Canister filters are called as sealed systems, which have a height of around 15 inches (38 cm), with a locking lid. There are intake as well as outtake valves on the lid connecting to the tubing that is associated with the tank. The role of the intake tube is to draw water into the filter and get it through different filter media prior to return the filtered water to the tank through the outtake valve. The inside of the canister filtration system differs according to the design of various manufacturers and their models. However, the functional aspects of this device remain the same. The lid holds the magnetic impeller motor (play the role as an electric water pump) in order to make the water flow back to the aquarium after it is purified by multi-stage filtration and safe for fish. To purify the aquarium water, the canister filter is made to pull the water flow inside of it through several chambers (baskets) full of different filtering agents (filter media) that help to take the water purification to a higher degree at every step. There are three types of filter media that respectively perform three types of filtration (mechanical, biological, and chemical). Mechanical filtration (sponge, floss, pre-filter media…) is to trap solid wastes and allows for manual removal once cleaning the filter. It keeps water free of floating particles and prevents the clogging of the filtration system. Biological filtration (ceramide rings, bio-foams…) helps to the build-up of helpful bacteria, which process nitrogenous toxins such as Ammonia (NH3) and Nitrite (NO2) harmful to fish and invertebrates. This is the most important stage for any healthy aquarium environments. Chemical filtration (activated Carbon, phosphate remover) is to remove harmful chemical toxins, impurities, discolorations to clearer your aquarium and make it smell good. It is also able to filter some organic chemical compounds such as phosphate and nitrate that are well-known to contribute to the yellow tint water and the outgrow of algae. There are many different brands of canister filters and most of them can be used for both fresh or saltwater aquarium.  Penn Plax is the most favorite canister filter with its very affordable price. Fluval provides the strongest water circulation and filtration to keep aquarium water ultra clean and clear. Eheim is reputed to be the most silent canister available on the market. Marineland Magnum has convertible filtration system and other unique features. SunSun and Aquatop are loved by their canister filters with UV sterilizer. 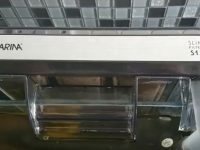 What size canister filter for my aquarium? Canister filters are available in different numbers of flow rate to be used on a road range of aquarium sizes. The flow rate is measured by gallons per hours (GPH), it is the most important parameter which decides if a filter fits your tank or not. This make sure the aquarium water is constantly being circulated and filtered. If the flow rate is too high for your tank size, it can cause stress and kill your fish, and vice versa the water can’t be perfectly filtered. There is a thumb rule for choosing a proper flow rate filter that is choosing one which has a flow rate 4 times higher than the volume of your aquarium. For example, if you want to get a filter for a 20 gallon aquarium, the filter which features a flow rate of 80 gallons per hour or a bit larger will perfectly fit the tank. Based on your tank: take the intention to the size of your tank, the type and amount of fish you have, and the frequency of maintenance time you are willing to provide. The larger of the filter capacity, the longer period between maintenance times as well as the less frequency you have to clean the filter. Depending on the time you can invest, and the goals that you have for your tank, choose the right size. Quiet operation: the only way to know what is quietest canister filter is read the reviews from other customers. Fluval 06 series filters are the most powerful filters which operate so quiet; however, Eheim Classic is the quietest filter brand. Durability and warranty: Give your attention to the pump which is the most important part of any canister filter, choosing one that can last for a long time. Consider the materials used to make the lid, valves, and lift-lock clamps which are the most fragile parts during maintenance. It is better to have a warranty from the manufacturer for the product you buy. Easy setup and maintenance: Some canister filters are built with quick disconnect valves on the lid which are very helpful in maintenance. These valves allow for disconnecting the water flow from the tank that offers you to disassemble the filter for cleaning without water leaks and mess. Following are some of the best brands for you to choose. Excellent performance of three types of filtration (mechanical, biological and chemical filtration). Holds 35-50% more water in the media baskets than round canisters. Water flow is noticeably increased and filtration enhanced due to the ability of this filter to use the entire canister space. Instant priming by pressing the button on the lid. Aqua-stop valves make maintenance easy by shutting off water flow without disconnecting anything. Easy to access the inside space to maintain with lift-lock clamps. Fluval 306 canister filter. Image from Fluval Aquatic. They comes complete with pre-assembled components and pre-packed filter media for instant setup. Instruction and quick start manuals are included for easy setup. Besides, an instruction video is also available if you don’t want to read the manuals. Fluval FX series include Fluval FX4 and Fluval FX6 models for extra large or overload fish tanks. These filters feature a very high flow rate to be able to purify large tanks with a huge amount of water and fish. They are designed for easy setup and maintenance and all you need for the installation is included. The instruction manual and Youtube videos are also available to help you quickly understand the filters. Cascade 500 (FR: 115 gph) for tanks up to 30 gallons. 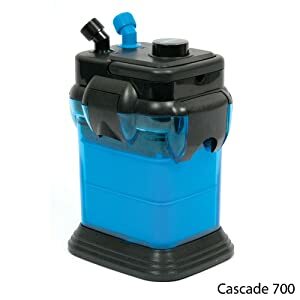 Cascade 700 (FR: 185 gph) for tanks up to 65 gallons. Cascade 1000 (FR: 265 gph) for tanks up to 100 gallons. Cascade 1200 (FR: 315 gph) for tanks up to 150 gallons. Cascade 1500 (FR: 350 gph) for tanks up to 200 gallons. The best thing makes Penn Plax Cascade series popular in aquatic hobby is that they come with the very affordable prices but still perform the good filtration to keep your aquarium clean for a long time. They are available in various models for a broad range of tank sizes up to 200 gallons and can be used for both freshwater or saltwater aquariums. These filters including large filter trays make it possible for containing a large amounts of filter materials that well performs chemical, mechanical and biological filtration. You can combine various filter media in order to accomplish a wide array of filtration to provide a clean and clear water environment for your aquarium fish. Besides, the larger filter trays mean the longer periods between replacement and are ideal for busy hobbyists. Installation is simple because everything you need to connect the tank with the filter is available. The filtering process will begin in about thirty minutes after installation and within only a day the water improvements are easily noticeable. The air-tight seal assures proper flow rate while maintain ultra quiet operation. It’s easy for you to maintain the filter for changing media or do other maintenance. Simply release the vacuum and remove the top, and then you can easy to handle inside the filter. Designed for fish tanks from 20 to 150 gallons, the Hydor Professional external canister filters are a good device for any fish keeper. The canisters boast of impressive flow rates, which range from 160 to 290 gallons per hour. The installation completes in less than 30 minutes and does not require any skills whatsoever. As a backup, they come with a user manual for the easy access and setup. They operate quietly unlike other models that produce uncomfortable humming noises and vibration when they operate for long periods. They consist of parts ball-valve connections to enable simple flow adjustments as well as easy flow shut off and removal for maintenance. Because of its flush design, the Hydor Professional models don’t allow for water by-pass. Instead, water is forced through the media baskets to perform the most effective filtration. HW-304B kit is designed to be used in large capacity aquariums and tanks of up to 150 gallons with a high filtration rate of up to 525 gallons per hour. 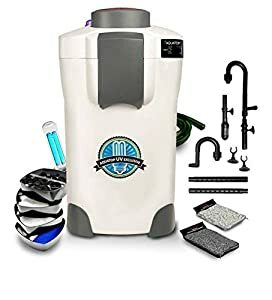 Like other SunSun models, this kit is equipped with a built-in 9W UV sterilizer to kill dangerous bacteria, parasites, viruses and spores that might be present in fish water. This feature is unique among the high-end brands. It features 5-stage filtration process with 4 flexible media trays. The mechanical stage is performed by large filter pads for mechanical removal of solid fish wastes and uneaten foods. The ceramic rings and bio-balls break down nitrates while SunSun’s activated carbons eliminate all harmful chemical impurities from the aquarium. The 9W UV sterilizer does the remaining job of killing microorganism. The SunSun Hw304B is designed to operate smoothly and quietly. The system is easy to install, use, control and maintain. The kit comes with a user manual that contains reliable information on how to operate and maintain the canister filter. There are also two smaller models for smaller tanks such as HW-303B Pro (370 gph) for tanks up to 100 gal and HW-302 Pro (264 gph) for up to 75 gal ones. There are three models ranging in flow rate from 264 gallons per hour to 525 gallons per hour. They are multi-stage filtration systems that work with both saltwater and freshwater aquariums. They can provide mechanical, biological and chemical filtration thereby eliminating almost all impurities from the fish tank water. The larger models (Aquatop CF-400UV and Aquatop CF-500UV) in Aquatop CF series include an UV sterilizer to get rid of harmful bacteria as well as algae spores. They operate smoothly and quietly without sound and vibration. 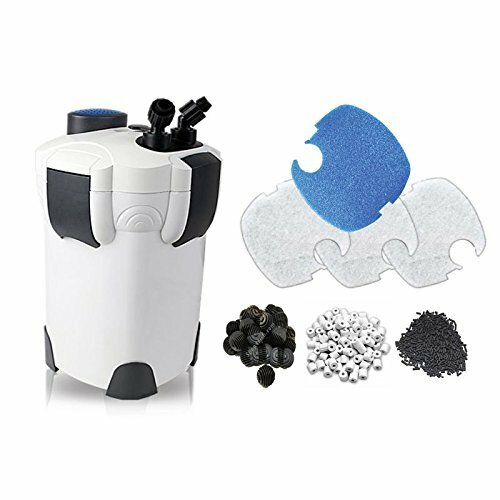 Besides the sterilizer, these canister filters come with fine filter pads (white), one coarse filter sponge (blue) and all the necessary plumbing for installation.  The filters also feature over three large filtration media compartments that allow you to add your preferred filtration media. Eheim Classic series are well-known as the quietest canister filters compared to other filters rated for the same tank sizes. The these filters incorporate all the features you want most for your aquarium filter. They are basically silent, extremely durable, very compact, super easy to maintain and set-up, very low maintenance, and highly efficient. Whether you’re starting out setting up your first larger aquarium or simply just want to upgrade your existing filter, the durable and reliable nature of the Eheim Classic filters make them worth to buy. 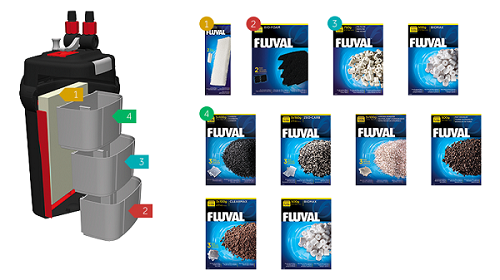 The Fluval G series are equipped with an intelligent microprocessor which is able to store and present information on water parameters, real-time filter performance, and filter cleaning intervals. Like other brands, this series also feature a self-priming button that makes it very easy to use. The core filter chamber is made for fiberglass re-enforced polymer that can withstand pressures up to 15PSI. The entire system is powered by an innovative three-component drive pump system that provides power, extended time reliability with no noise and optimal performance. AquaStop valves included allow you to simply stop the water flow by bringing the AquaStop valve lever into an upright position. By only a simply lift of the AquaStop, you can conveniently remove the complete assembly without separating the hosing. They are designed for use in both freshwater and saltwater environments. The Marineland Magniflow series features an easy to access design for simple and convenient setup and maintenance. 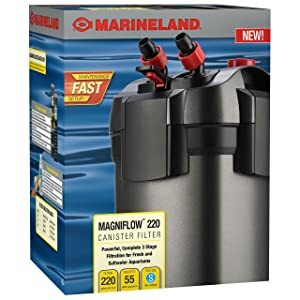 The different models of Marineland Magniflow canisters have different capacities ranging from 30 gallons to 100 gallons with flow rates of between 160 gallons per hour and 360 gallons per hour. They feature a lid, which you just press down to ensure watertight seal or lift it up for easy cover removal. Magniflow canisters are fitted with Stack N’ Flow filter media trays. These flow through media layers for total chemical, mechanical and biological filtration. They also feature a quick prime button, which fills the filter chamber with water for self-priming system startup. Another great feature is the valve block for quick release. This feature instantly shuts down water flow and separates from the motor enclosure for fast, spill free canister maintenance. The package includes carbon filter bag, filter foam, polishing filter-floss pad, bio-filter balls, ceramic bio-filter balls as well as inlet/outlet tubing and assembly. The Black Diamond® premium activated carbon removes odors, water impurities as well as discoloration. These filters are ideal for use in both salt and freshwater aquariums. 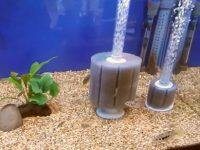 Canister filters and Hang-On-Back power filters are all very powerful and popular in aquarium hobby these days; however, there are some specific features different between them. High flow rate to keep the water to be regularly filtered and circulated, even in a large fish tank. Flexible in using filter media, you can use your favorite filter materials. Excellent performance of mechanical, chemical, and biological filtration because it can contain a huge amount of filter media. They need very little maintenance and do an excellent job to keep your aquarium water clear and clean. 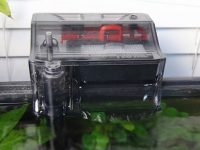 They are ideal fish tank filters for busy people who can’t find the time to clean their fish tanks. They mostly operate silently and consume a very small amount of electricity. The impellers (water pumps inside the lids) are reliable and can last for more than a decade. They are expensive so you should consider a canister filter only if you have a large fish tank. Conclusion, If you have a small tank under 20 gallons, a power filter is cheap and strong enough to keep the tank clean. However, if you have a large tank or your tank is overload, a canister filter is a greater choice. Canister filters are also chosen by many hobbyists for their small tanks because they require less maintenance than power filters that makes them the best choice for busy people. What is the best canister filter for saltwater/freshwater aquariums? The best canister filter is one which can provide the best environment for the performance of these filtration types. Although some other filter types such as power filters and internal filters can do all 3 filtration types, the canister filters are manufactured to perform these best. Most popular canister filters in the market today as well as all ones appeared in this article are made of materials safe for both saltwater or freshwater applications. How to put/layer media in canister filter? 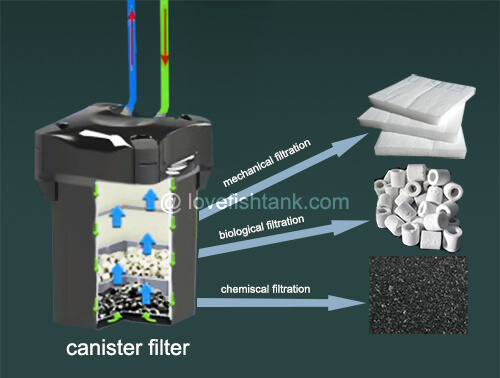 Follow the water flow direction created inside the canister filter, layer the filter media according to the sort from mechanical to biological and finally to chemical media. 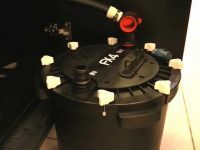 Where to put purigen in canister filter? The purigen should be placed in the final stage where the water is finally filtered before it exits the canister. You can also place it previous to the biological stage (ceramic rings). How to prime a canister filter? Most modern canister filters today such as Fluval 06 series and Penn-Plax Cascade series are able to prime by themselves, only press the button on the lid several times to get the first water flow into the filter and it will do the rest work. If your filter can’t start by itself, fill the canister to the top before attaching the lid and plugging it in. How to clean a canister filter? Looking on the filter brand and the media type used, the maintenance will vary based on the brand you use. Many have cartridges, media bag, while others need to be replaced regularly. The maintenance of other canister filter brands is very similar and the only difference is the disassemble/assemble way for each brand. The rest work is to clean the filter media with the old aquarium water to reserve the helpful bacteria. You also have to wash the pump and tubes of the canister filter. This is efficiently done with the use of cleaning kits for the aquarium tube sold at pet stores. The larger the filter capacity is and the less fish you stock in your tank, the less maintenance times you will do. A canister filter usually need less maintenance than other filter types; and it is ideal to clean your canister every 3 months for maintaining its effective filtration. Although a 30 gallon fish tank or larger ones can use a canister, there are some small canister filters for 10 gallon fish tanks or smaller ones. And if you have a large sized aquarium, having a canister filtration system is definitely a must. 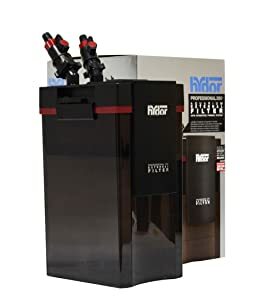 It is important for you to make an educated selection, based on your needs, your schedule for maintenance, and simply what you are looking for, in relation to the best canister filter for you.